Recently I got the chance to work with Author Assistant for an exclusive interview with a quirky sci-fi author. Check him out! Q: What gave you initial inspiration for your new book Love, Murder & Mayhem? Colchamiro: While writing Genius de Milo, the second book in my Finders Keepers scifi backpacking comedy series, I briefly introduced the character of Angela Hardwicke, private eye. She only appeared in one chapter, but she’s in that classic Sam Spade tradition. I knew immediately that I wanted to spend more time with her, so I significantly increased her role for the third and final book in the series, Astropalooza. Yet before I give her a series of her own—which I’m starting soon—I wanted to write a short story with Hardwicke in the lead, to get a better sense of who she was, her rhythms, and the kinds of stories I wanted to tell. 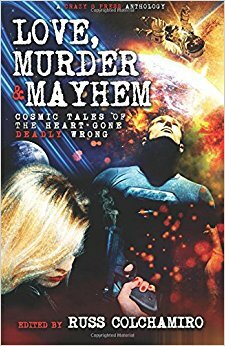 So I started the Love, Murder & Mayhem anthology through my publishing group—Crazy 8 Press. We have 15 stories, from 15 authors (including me) with every story containing at least one act of love or romance, at least one murder, and lots of mayhem. I initially thought I’d get nothing but private stories—I did a get a few—but the anthology contains superhero and supervillain stories, off-world and space cruiser stories, as well as A.I., private eyes, sleep surrogates, time travel, an aliens/monsters mash-up and … one DuckBob! Q: What music choices they have for the book? Colchamiro: Actually, my story in Love, Murder & Mayhem—“The Case of My Old New Life and the One I Never Knew”—has Hardwicke investigating a case of arson at a rock n’ roll club she visited the night before to see her favorite band. I’m a musician myself—a drummer—so it was particularly fun to set a murder mystery in that world. Q: Tell us a little bit about your Finders Keepers trilogy. Did it change you? How did it grow from an idea to a series of published novels? Colchamiro: During my early 20s I backpacked through Europe at a time when that wasn’t nearly as common as it is today. We’re talking 1994, so pre-Internet. I had one of those trips that in a very real way changed the fabric of my life. Later, I took a two-week trip to New Zealand, with a buddy I met while backpacking in Europe. These trips transformed me from a never-traveled-anywhere-of-significance person to a I-now-want-to-see-the-whole-world person. Separately, I had this wild scifi comedy concept that I was dying to explore, where Jason Medley had a jar of the Universe’s DNA. I didn’t have any clue who Jason Medley was, or why he might have a jar of the Universe’s DNA, or what that even meant. But I loved it, and wanted to write something epic. The two ideas—the backpacking and the scifi—in my mind fit together so well that I turned it into a 3-book series – Finders Keepers, Genius de Milo, and Astropalooza. Each book is written in part like a travelogue with a you-are-there feel, yet the two main characters, backpackers Jason Medley and Theo Barnes (who’s from New Zealand) find themselves being chased around the globe by a cadre of characters from this world and the cosmos, wanting to steal that jar of the Universe’s DNA for themselves. In each book, Jason and Theo save the day. And in doing so, they make matters so much worse. By the time we start the third book, they’ve inadvertently set in motion the next Big Bang, which, if comes to fruition before Astropalooza—a cosmic celebration of the Universe—existence as we know it will be eradicated. So, you know … they’ve got some issues to deal with! the characters in my Hardwicke story—Frankie the Brush, a general contractor—is based (with permission) on my actual contractor, whose name is … Frankie the Brush. They’re not exactly the same, but pretty darn close! The real Frankie got a huge kick out of it. Ultimately, though, every character has to be unique, or they fall flat. Colchamiro: I’ve got books! Buy ‘em up! They’re fun! And if you’re in the area when I’m out on book tour, stop by. Meeting new fans is always my favorite part of doing appearances. And look for some Hardwicke books. I’m working on them now. I’m planning to do an entire series.